There is about a 1 in 4,000 chance a unique color variant of a Pokémon will appear in a random encounter, making “shiny Pokémon” the rarest type of monster you can capture. Some people have played Pokémon for decades and have never seen a shiny. Here’s how you can beat those odds and get a shiny in Sun and Moon. First, you need to pick a monster. Be warned that this procedure takes lots of time, so choose carefully! 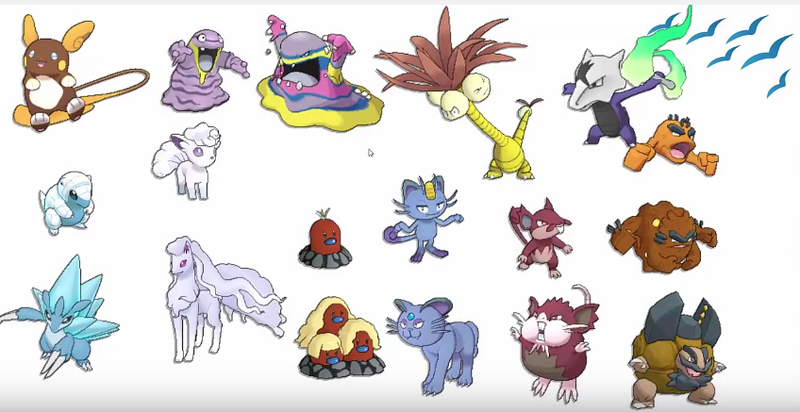 If it helps, you can check out what the shiny sprites for each monster are here and here. After you pick your target, stock up. You’re going to need plenty of revives, healing items, PP-replenishment (berries, elixers), and crucially, an Adrenaline Orb. (Here’s where you can obtain them; you should have at least a couple if you’ve played through the story.) Then, you need to go into battle against the monster you want to encounter in shiny form. Pokémon Sun and Moon have a mechanic where monsters call for help. This is what you’re going to abuse. Your first move during a shiny hunt is to immediately use an Adrenaline Orb, which will make it more likely that your target will call for help. After that, you need to keep that same battle going for as long as possible. Get your target to low health—do NOT kill it—and wait for it to call for help. Once the second monster appears, kill one of the two Pokémon, and let the remaining critter call for help once more. The more new monsters are called into battle, the higher your “chain” goes, and the more likely it is that you will eventually encounter a shiny down the line. It’s a very long, involved process. Some shiny chains can take hundreds of calls for help, some less. The first time I tried it I didn’t go in prepared with enough items or a good game plan, and I ended up burning through like 20 hyper potions, 20 revives, and a nearly wiped team, both in terms of HP and in PP. Worse, because it’s a boring process, I once even started falling asleep in the middle of a very long chain and accidentally killed my target Pokémon. I was devastated. Don’t let it happen to you! What I’ve found helps is to pick a monster I can easily one-shot if I wanted to, but is still strong enough to not automatically die when I use a low-power move—shiny chains both require you to wipe out as many Pokémon in a row as you can, while also keeping one alive. In particular, I found that going in with a Pokémon that knows “False Swipe” helped, as it is a “restrained attack that prevents the target from fainting.” Here’s a list of Pokémon who can learn the move. You should also have a good idea of the moveset that a wild Pokémon might have going in, so you can plan for it. For example, I initially wanted to try for a shiny Vulpix, but the problem is that it has a move that can deplete your PP—and keeping your PP high is already a problem in shiny hunting without that added hiccup. Other Pokémon will come with their own quirks, so it’s worth doing your homework before jumping in. You also have to be prepared to just waste moves whenever necessary. There will be times when a monster calls for help and nobody responds, but since you can’t kill that lone Pokémon, you still need to keep the battle going with that enemy intact. In those cases, I either switched a monster out just to keep things moving, or I ate one of the cafe cookies that would have no effect, just to get to the next turn. It’s not the coolest shiny Pokémon, but hey. I was testing out if this method truly worked. Voila. The neat thing is, chaining is useful for things outside of shiny hunting, too. Chained Pokémon are more likely to have better stats/IVs. Pokémon can also call in monsters within their evolutionary line—I’ve seen a Snorunt call a Glalie into battle, though others have used this trick to force way rarer Pokémon to appear. You could, theoretically, get a Gyarados early in the game, right after getting a fishing rod, just by finding a Magikarp. Others have summoned low-level Salamences into their game just by finding a Bagon. It’s wild.